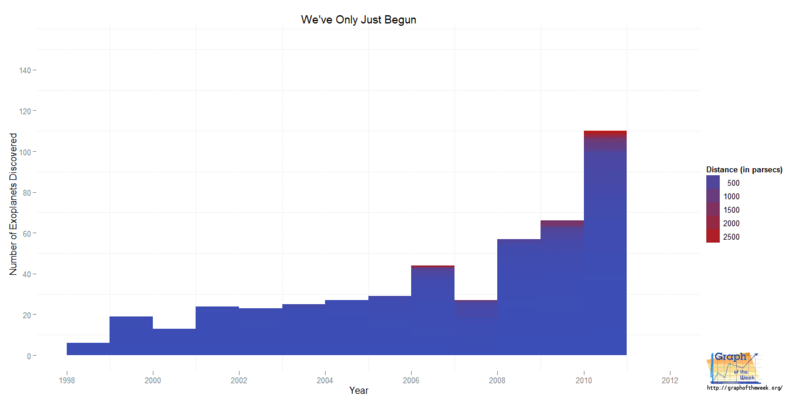 By 2030, we will have found approximately 10,000 exoplanets. The rate at which they are being discovered continues to grow in an exponential manner. There aren’t other limiting factors. There is a huge amount of variability that exists in real life. For example, there are only a finite number of telescopes capable of detecting exoplanets in existence – and all of those are time-shared for other purposes. In addition, there is a finite number of astronomers who’s interests lie in this area. Other factors would include budgets, detection methodologies, automation techniques, political stability and others which cannot be foreseen. In other words, don’t take that prediction too seriously. Or perhaps you should. After all, we may discover far more exoplanets in that same time frame. Studying the above graph, it can be seen that planets are being discovered farther and farther away, which says something about the techniques used to discover them. It is mind-boggling to think that we can sense the presence of objects so far away mostly by inference. The thought of travelling to any of these distant planets is even more mind-blowing as we face many problems ‘just’ getting to Mars. Looking at the chart below reveals our ability to see smaller and smaller planets as our techniques and knowledge grow. 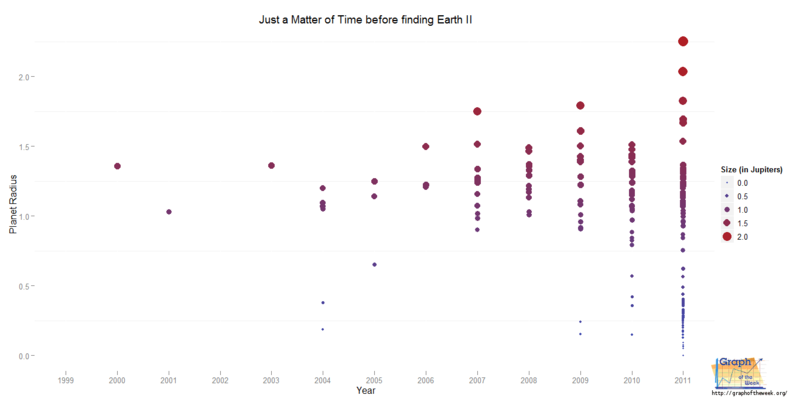 If that trend continues, it is only a matter of time before we can detect Earth-sized exoplanets and perhaps smaller. This will be more exciting than finding all of the current gas giants since we can’t land or live on those – the Earth-sized rocky planets are another matter. In those cases, not only is the gravity of those planets (probably) comparable to ours, but we have something to land on and if it has oxygen (and other gases favorable for respiration) then perhaps we might someday set foot there. If we were to ever set foot on another planet that harbors intelligent life, it would be very illuminating to discover their political systems, social norms, history and culture to name a few. Would they have lots of countries like us? And could we attribute a democracy index to them as well? If it is mostly uninhabited (not likely if it has an oxygen-rich atmosphere), then how might we re-create civilization there? Would we learn from our past mistakes? And how might relations be between Earth I and Earth II? Eventually (if not immediately) Earth II would be independent – would they have to fight Earth I for it? The human species has gone from traveling by horse and carriage to landing on the moon in less than a century. Forty years after that we have begun to detect exoplanets. As time marches on, it will be interesting to see developments in this area, especially if we find life elsewhere. It might actually be more interesting to find a planet capable of sustaining terrestrial life as that would give us a target for migration. After all, if it ‘just us’, then maybe we can make better use of the space. 1) If life is discovered elsewhere, how will that affect humanity? 2) Will we ever be able to launch a manned expedition to another world outside our solar system? 3) Which will be the first country to make it to Mars, if ever? These graphs were generated using the ‘ggplot2‘ package within the R programming language. In the future, different plotting packages will begin to be seen here, including 3d plots and trellis plots. Stay tuned! To leave a comment for the author, please follow the link and comment on their blog: Graph of the Week.